Venice, 1586. William Shakespeare is disguised as a steward to the English Ambassador. He and his friends Oldcastle and Hemminges possess a deadly secret: the names of the catholic spies in England who seek to destroy Queen Elizabeth. Before long the Pope’s agents will begin to close in on them and fleeing the city will be the players’ only option. In Verona, Aemelia, the daughter of a Duke, is struggling to conceal her passionate affair with her cousin Valentine. But darker times lie ahead with the arrival of the sinister Father Thornhill who is determined to seek out any who don’t conform to the Pope’s ruthless agenda . . .
Events will converge in the forests around Verona as a multitude of plots are hatched and discovered, players fall in and out of love and disguises are adopted and then discarded. Will Shakespeare and his friends escape with their secrets – and their lives? 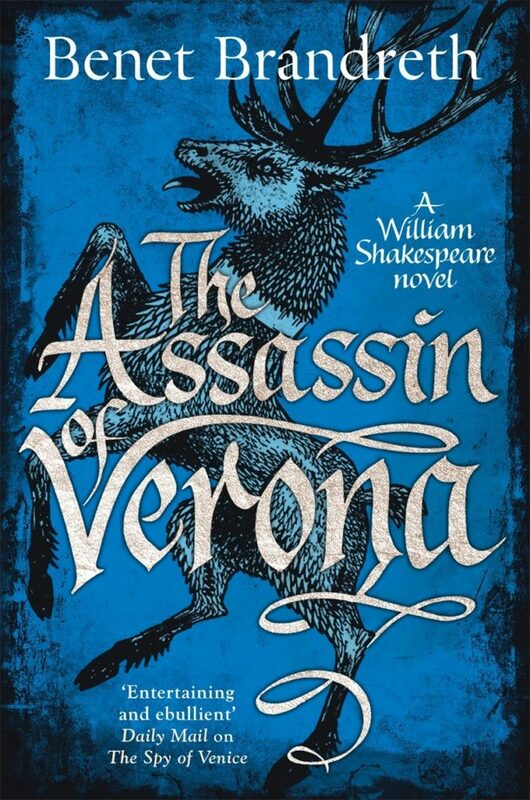 Bursting with breathless action, swaggering charm and rapier-sharp dialogue, The Assassin of Verona is the gripping new novel from the acclaimed author of The Spy of Venice.